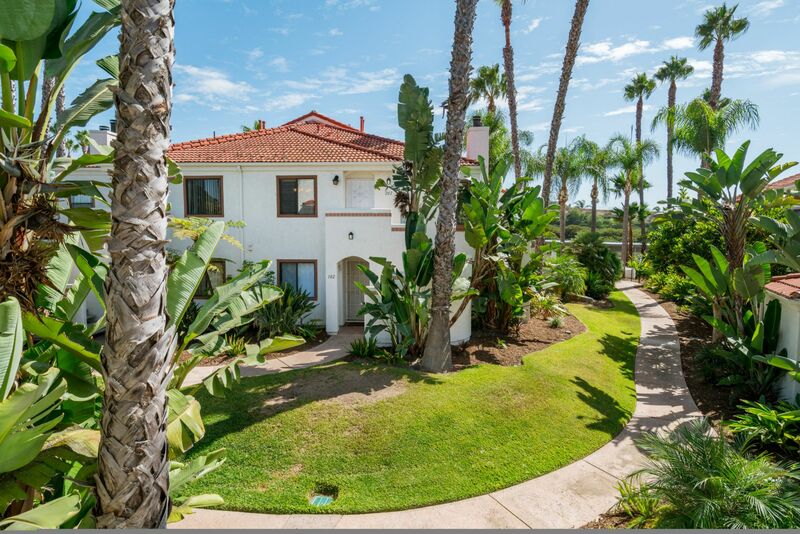 Welcome Home to Casablanca, a tropical paradise in the Poway School District! Offered at $429,000-$449,000. Hurry this unit won't last, whether you're a first time buyer or a growing family look no further. This is move in ready and all you need to do is put your finishing touches. Private top floor 3 bed 2 bath unit! New carpet (upgraded padding w/memory foam & moisture barrier padding), new SS appliances (5 burner stove/oven, microwave, dishwasher & disposal). The kitchen has plenty of cabinet space and has a laundry closet for a stackable washer/dryer. Cozy and bright dining area. Vaulted ceilings w/gas fireplace, two balconies w/sliding glass doors off of the living room and master bedroom. Both sliding doors have new screens and rollers. There is also a large 6x5 storage shed off of the living room balcony. All of the bedrooms feature full size closets with mirrored doors and you can hear the relaxing sound of running water from dual waterfalls just outside down below. The spacious master bedroom has vaulted ceilings and ceiling fan. Both bathrooms have new shower heads and tub spouts and the master has a dual sink and large walk in closet. This unit comes w/two assigned parking spaces nearby #310 (carport w/extra storage) & #781 (uncovered) w/plenty of guest parking spaces. Lots of cabinet space & stackable laundry in kitchen closet. The community pool is steps away with a large pool and spa with shower and bathrooms (4 pools in the complex). Centrally located and close to shopping, YMCA and fwys 54 and 15.